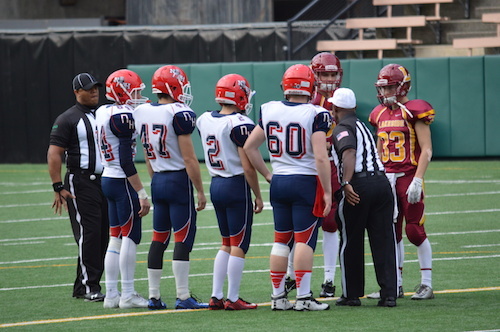 In a topsy-turvy elimination game on Friday between Lakeside and Juanita, a late momentum swing sparked by Kallin Spiller and Kimijah King propelled the Lions to a dramatic victory. Junior Tea Adams carried the bulk of the Rebels offensive production netting a game-high 24 points, many of which scored in transition. Shalexxus Aaron added a dozen as well in addition to a major role in the paint pulling down key rebounds. A three-pointer at the halftime buzzer by Lakeside’s Kelly Keen cut the Juanita lead to a single point heading into the break. The win keeps Lakeside alive for another day as they await their matchup for the fifth-place seeding game with the next opponent set to be the winner of Rainier Beach and Roosevelt. Most games in high school basketball do not have the pressure of a loser out game. To both of these teams, a loss marks the end of the season and looking towards next year. Mercer Island, the underdog in this game, came out in the first quarter with a masterful game plan. Knowing that they would have trouble guarding Daejon Davis and Isiah Brown in transition, they focused on using the duration of the shot clock and slowing the game dramatically. The athleticism favored Lakeside, and Mercer Island’s only hope was to control the tempo. The Islanders looked great in the first quarter. A 12-2 run in the first gave the Islanders a 17-13 lead going into the second. And then the wheels fell off. Fast forwarding to the second quarter, the Lions began getting into transition and finding Kiki Boyle on open threes; he hit 6 on the day. The closed the quarter on a 12-0 run, and extended that to 19-2 into the third. 16 points in a quarter is a good amount of points for a high school team. When you score 16 points over the course of two quarters, against a team from the Metro conference, you are in trouble. The shots that fell for the Islanders in the first were not falling in the second and third. The turnovers piled up, and the Islanders found themselves down 19 points entering the fourth quarter. The final week of regular season hoops kicked off with a full slate of matchups Tuesday night. A Metro League game with playoff implications attached was the clash between host Roosevelt and Lakeside who are vying for postseason berths. The Lions feature leading Metro scorer in Isiah Brown at 27.6 points per contest where the Riders counter with senior Cam Haslam with a shade under 20 per game. This game carried major weight for deciding the final seeds coming out of the most competitive league in the state. Lakeside’s tenacious interior defense in the first quarter provided a spark to grab a quick lead. They prevented the Riders from finding a groove on offense early in the game. The gameplan for each team contrasted greatly as the Lions attacked the rim early and Roosevelt ate the bulk of the shot clock by distributing the ball. LHS sophomore Daejon Davis knocked down a difficult lay-up and one at the first quarter buzzer to give his team a 13-8 lead after one frame. Roosevelt woke up in a big way in the second quarter to the tune of a 16-0 run over the first five minutes. Haslam started heating up by notching 10 of his team-high 26 points in the quarter. The Riders capitalized on Lakeside’s inability to get shots to fall through the cup by setting up good looks to a variety of scorers such as Jakob Bauer and Jonathan Lang. The Lions finally registered their first points of the quarter at 2:06, but were trailing by double digits at that point. At intermission, the home team was buzzin’ as they led by a dozen! When the second half commenced, Roosevelt kept the pedal down by extending their lead to nearly 20 points and placing the Lions in danger of having the ability to climb back into the game. Isiah Brown reached a point where enough was enough and started to will his team to make a comeback. He used his explosive first step to shed his defender and elevate to the rim. The junior would shoot lights-out from the free throw line in the second half en route to 24 of his game high 30 in the second half. At the end of the third, LHS cut the deficit to 42-29 and their body language displayed they could taste blood in the water. As the Lions playing eight minutes of frantic catch-up, Roosevelt responded by knocking down timely buckets to quell momentum swings. Lewis Gregerson-Spencer and Carl Salvino made their presence felt by converting on crucial possessions down the stretch. Lakeside’s Davis finished a two-handed slam which sparked a late surge for the visitors including a 5-point boost by Isaiah de la Fuente. At 1:36, the score was 58-51, but the margin of error was razor thin and the Roughriders were able to put the final nail in the coffin. Coach Bart Brandenburg picked up a quality win for the green and yellow. November has arrived which means playoff football is in it stages of infancy as seeding is underway for the postseason. The seventh and eighth seeds for the Metro League were to be decided by the Lakeside Lions and Nathan Hale Raiders. It is fitting the game was played at Memorial Stadium because this contest was indeed memorable. The Lions took advantage of an extended drive early in the contest by allowing Wyatt Paul to boot a 20 yard chip shot. Paul was a big factor in the game as his leg was responsible for 9 points and a great deal of field position advantage for his squad. Hale responded with a Nathan Cooprider quarterback keeper from five yards out for a Raiders lead. Cole Stephens returned the favor with a 13 yard scamper of his own for the third of eight lead changes in the game. The Raiders turned up the intensity a notch by blocking a field goal and forcing a pick in the hands of Sam Tessema. The latter led to a Naweeb Kamiab run to establish a 14-11 lead which they took to the locker room. Heading into the third trailing by only three points was a stroke of luck for Lakeside because they committed nine penalties to Hale’s one. The yellow laundry started to catch up with Lakeside in the opening minutes of the third, as they committed two personal fouls which aided a touchdown drive capped off by a 25 yard run by Noah Witmer. On the ensuing drive, Lakeside’s quarterback Bennett Dondoyano found a wide open Mayan Chavez and connected, but the ball mysteriously came free from the Lion receiver’s hands mere yards from the endzone. Nathan Hale took advantage by feeding Witmer and he delivered with another touchdown run, this time from 26 yards out. NHHS had the momentum at this point leading 28-11. The Lions took it back as they conducted a three-play, eighty yard drive which finished on a 37 yard Stephens run. After three quarters, Hale led 28-18. To climb back into the game, Lakeside was forced to gamble on fourth downs to keep the chains moving. With 10:45 left, Cole Stephens scored for the third time on a 53 yard screen pass from Dondoyano. Minutes later, Dondoyano got a TD of his own after Stephens converted on a 4th and 3 previously. Hale bit back on a Webb Hopkins touchdown grab, one of many fine catches by the senior. NHHS recovered the ensuing kickoff in the redzone, but came away with no points. With 1:37 remaining, Lakeside had to travel 98 yards to erase a 3 point deficit. The Lions were able to get to the Hale 2 with 5 ticks left. Wyatt Paul hit a 17 yard FG at the buzzer to tie it up 35 apiece. We headed to overtime. 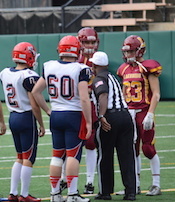 Hale would get the ball first as Lakeside chose to defer after winning the toss. Cooprider found William Sanders open on an option from 10 yards out that tricked the Lion defense. Lakeside needed to match the Raiders to keep the contest alive. Cole Stephens stepped up as he did all game by punching the pigskin in from 2 yards out. The game continued. Lakeside won the toss again and chose to receive. For the fifth and final time, Cole Stephens barreled into the endzone from the one yard line. Needing a touchdown, Nathan Hale found themselves in a fourth and two situation. They handed the ball to Sanders. He dove forward very close to the first down marker. It was close. The chain game came out to measure. Short. Ballgame. Lakeside wins 49-42 to take the seventh seed in the Metro playoffs. Hale takes 8th. The 3A runner-up from a season ago has unveiled its new gym, a spectacular venue for high school basketball. All that is missing at this point for Lakeside is a win at the new house. The Lions would get their chance to pick up that victory Friday night against Eastside Catholic following up a 53 point performance by Isiah Brown last week against O’Dea. The Crusaders have established themselves as a formidable force in the Metro League with a combination of athleticism and precision shooting. The Lions would need a complete thirty-two minutes of play to take down their division foe sitting ahead in the standings. An energetic Lakeside student section gave their Lions a lift early as Brown knocked down his first two shots, a double-clutch jumper and a rainmaker from the perimeter. Freshman guard Daejon Davis jumped the passing lane on a Crusader possession and finished strong with a highlight dunk. Eastside Catholic demonstrated their multi-faceted scoring abilities as slashing buckets at the cup and three-balls began to fall. ECHS set a tough trap in the Lakeside backcourt which gave Lion guards trouble with their entry passes into the offensive zone. The Crusaders were 8/19 from downtown in the ballgame. A double-digit lead ECHS built midway through the second frame was cut to seven going into halftime. At the break, the visitors led 34-27. Lakeside rallied behind their freshman prodigy Daejon Davis early in the third as the 6’2” guard forced his way into the paint on several trips down the floor. His aggressiveness led to eight points in that third frame for the Lions. Crusader senior Ian Christie twisted his ankle and did not return in the ballgame for EC. Brown continued to sizzle throughout that second half as the bulk of his game-high 39 points came in the final sixteen minutes of the contest. Despite allowing the Lions to tie the ball game in the second half, the Crusaders retained their composure by knocking down buckets when needed. The exclamation point in the game was a tomahawk slam by forward Matisse Thybulle. When the buzzer sounded, ECHS picked up their eighth league win to the tune of a 73-68 victory. With Kanye West preparing to go on stage just a few blocks away, the Lakeside Lions made the short trek to Memorial Stadium to play the home-side Cleveland Eagles. As always, the Cleveland cheer team increased the decibel level and provided a great atmosphere for this ballgame. Lakeside jumped out to an early 14-0 in the first quarter, backed by a 21 yard run by junior Cole Stephens and a pass from senior QB Adam Hinthorne to classmate Mike Padden. Cleveland answered early in the second with a 12 yard TD run from sophomore Zechariah Brown, but Lakeside countered with three straight scores, an interception returned for a touchdown by Jack Betcher and another score for both Padden and Stephens. Cleveland answered with a late score in the second by Rachaun McConico, but trailed 35-14 at the break. With a 21 point lead in hand, Lakeside slowed the game down in the second half, taking their senior QB out and primarily running the football. Cleveland added a couple of late scores in the fourth, but ultimately it was too little too late, with the Lions winning by a final of 45-28. Kudos to Lakeside kicker Trevor Peterson who knocked in a 41 yard field goal in the fourth quarter, what a great kick! With Los Angeles Clipper Jamaal Crawford in the house, Rainier Beach faced off against the Lakeside Lions in the Sea-King district final. The gym was electric, with the Lakeside student section bringing the noise throughout the contest. This was the third time these teams had met; once in the regular season where Beach won by 14 and the other in the Metro championship game where Beach won again. Lakeside came out looking for the upset. The Lions started the game on a six-zero run, but Beach responded immediately with a nine zero run of their own. Senior Marquis Davis led the charge for the Vikings, scoring 10 points in the quarter and converting on all three of his three-point attempts. Lakeside responded with a three pointer by junior Tramaine Isabell to cut the Beach lead to just three after one quarter, 18-15. Both teams came out hot in the second, with Rainier Beach hitting four threes in the quarter and Lakeside hitting five. Davis led the way for the Vikings again in the second with eight points, and Beach took a five point lead into half. Coach Hobson must have focused on defense in the halftime talk with his players, because Lakeside came out with great defensive intensity in the third quarter. They began by playing relentless defense on Marquis Davis, forcing the ball out of his hands and making another Viking beat them. Lakeside gave up just eight points in the third to the Vikings, nearly matched by Isabell’s seven for the Lions. Lakeside reclaimed the lead late in the third on a D’Marques Tyson layup and took a five point lead into the fourth, 53-48. Both teams were in the bonus early in the fourth quarter, and the game essentially came down to a free-throw contest. In the final quarter, Lakeside shot 13 for 19 from the line and Rainier Beach shot 9 for 19 from the line, four points that would have drastically changed the outcome of the game. With 2:57 remaining in the fourth, Beach junior Naim Ladd tied the game at 59 with two free-throws. 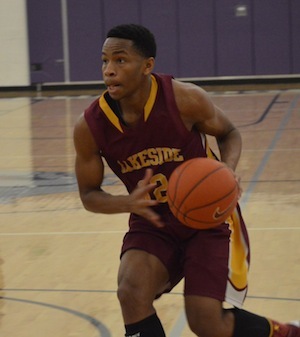 Lakeside freshman Isiah Brown responded seven seconds later with two free-throws of his own, and Lakeside would never relinquish the lead from that point. A laundry list of shooters for both teams came to the stripe, and Lakeside hit more down the stretch to win the 3A Sea-King District Championship, 72-65. What a game! In an electric atmosphere in the first semifinal game of the day at Bellevue College, the Mercer Island Islanders took on the Lakeside Lions for a trip to the Sea-King District Final. Mercer Island came out hot in the first, starting the game on a 13-2 run while capitalizing on three Lion turnovers. Lakeside could not break into Mercer Island’s 2-3 and 1-3-1 zone, and Mercer Island took a 22-12 lead into the second. Mercer Island moved into a man to man defense in the second, which allowed Lakeside to heat up from the field. The Lions went on a 25-6 run in the quarter behind three three-pointers from Tremaine Isabell. Lakeside took their first lead with 1:52 remaining in the second on an lob dunk from D’Marques Tyson. Isabell added a pair of free-throws and a layup to take a 37-31 lead into halftime. Mercer Island came out after the break and matched Lakeside’s intensity on both the offensive and defensive sides of the ball. Senior Kaleb Warner knocked down three mid-range jump shots and senior Joe Rasmussen added seven points of his own to lead the Islanders in the quarter. But Lakeside senior Peter French kept the Lions in front with four offensive rebounds in the quarter and three put-back layups. Both teams scored 13 in the third and Lakeside took a six point lead into the fourth. Lakeside continued to keep their foot on the gas in the final quarter. Six points from Isabell and four points from both Tyson and senior AJ Adekoya were too much for the Islanders to surmount. 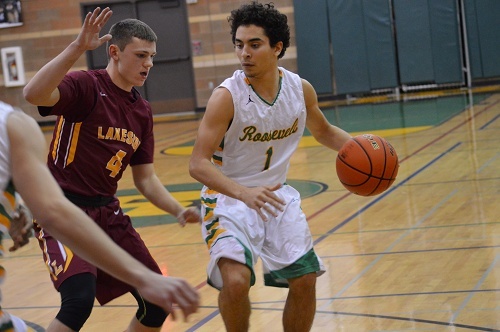 Islander senior Kaleb Warner tried to keep his team in the contest with eight points in the quarter, but Lakeside’s 13 point lead with 1:18 to play was too much for Mercer Island, and the Lions closed the contest with a 68-61 win. Saturday – 6:30 PM at Bellevue College. Saturday – 11:30 AM at Bellevue College. In their fourth matchup this year, the Seattle Prep Panthers took on the Lakeside Lions with a berth to state at stake. The crowd was electric for this Metro contest in a SeaKing District match-up. Seattle Prep jumped on Lakeside defensively and forced seven turnovers in the first quarter but could not capitalize off their defensive pressure. Lakeside built a 7-6 lead and added two more uncontested layups by junior Tremaine Isabell to go up 11-6; they closed the quarter up 13-8. Both teams came out cold to start the second, combining for only 17 points in the quarter. Prep came back to take the lead on a DJ Fenner basket with 3:38 remaining in the second, 16-15. But Lakeside scored five of the last seven points to go into halftime with the lead, 20-18. Prep started the third quarter on a 9-2 run to take the lead back from the Lions, 27-22. The teams exchanged baskets for the remainder of the quarter, and Prep took a 33-28 lead into the fourth. Lakeside came out hot in the fourth, with two baskets in the first minute to cut the Panther lead to one. The Lions added three pointers from D’Marques Tyson and Matthew Poplawski to take a four point lead with 4:39 remaining, 38-34. Prep continued to battle, cutting the lead to two with 1:14 remaining on a three pointer by senior Jack Roger. Isabell for the Lions answered from the free-throw line, hitting three of four in the final minute to secure a Lion victory, 50-48. With the win, Lakeside secures a trip to state and will play Mercer Island at 3pm at Bellevue College on Thursday. The Panthers will play will play O’Dea in a loser out game at Bellevue College on Friday at 3pm. 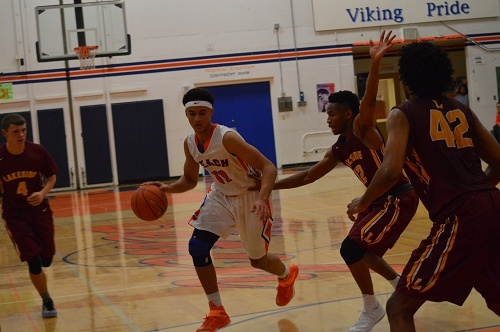 The #2 ranked Rainier Beach Vikings took on the Lakeside Lions for the Metro League Championship on Friday night in a packed house at Garfield High School. The regular season contest between these two ended in a 14-point win for the Vikings, but with the Metro title at stake and the building electric, everyone knew this would come down to the wire. Lakeside started the game aggressively, attacking the hoop and drawing contact going through the lane. Viking starters Fuquan Niles and Shaqquan Aaron both picked up two fouls late in the first quarter and ended up sitting for the remainder of the half. Lakeside’s smothering defense held the Vikings to just 10 points in the quarter, and the Lions took a 13-10 lead into the second. 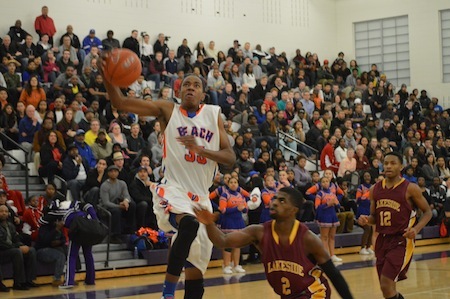 Rainier Beach’s shooting woes in the first turned into a shooting clinic in the second. The Vikings began the quarter on a 14-0 run, forcing five Lion turnovers and capitalizing on baskets in transition. Senior Marquis Davis led the Vikings with eight points in the quarter, followed closely by teammate Elijah Foster with seven. Beach took a 37-23 lead into the half. The tables turned again in the third quarter; it was now Lakeside’s turn to put their foot on the gas, starting the quarter on a 15-5 run. Niles picked up his fourth foul with 5:20 remaining in the third, and Lion big man Peter French picked up his fourth foul with 4:53 remaining in the period. Lakeside kept up their offensive rhythm until the game took a turn with 1:03 remaining in the third on a hard foul by Marquis Davis. Unfortunately, this did not turn out well for the Vikings as Marquis Davis was ejected, Shaqquan Aaron and Coach Mike Bethea both receiving technical fouls. Lakeside junior Tremaine Isabell also received a technical foul. The outcome gave four free-throws to the Lions, and Matthew Poplawski stepped up to the line and made all four. Lakeside outscored Beach in the quarter 21-12, cutting the Viking lead to five entering the fourth. 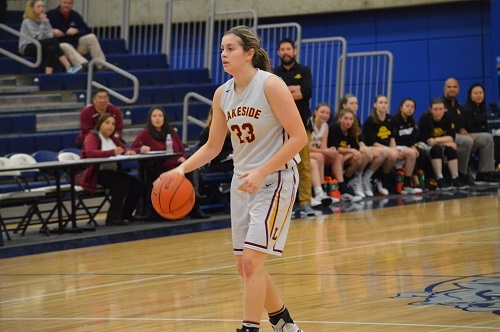 Lakeside continued to battle in the fourth quarter, exchanging baskets with the Vikings and chipping away at the Beach lead. Lakeside cut the lead to just three with 32 seconds left, with the ball. Lion coach Tavio Hobson drew up a play for the Lions, but the inbounds pass was stolen by Rainier Beach and led to a leak-out dribble drive that forced Lakeside to foul from behind. The foul was ruled a flagrant, giving Beach two free-throws and the ball, ending Lakeside’s chances at the upset. Beach won in a nail-biter, 69-61. It was a Great Game to watch!